Have you run out of gift ideas for your special someone? A gift card for a salon or Spa service is always appreciated! We will help you select the right gift for holidays, Valentine’s Day, Mother’s Day, Weddings, Graduations…or Thank You’s. 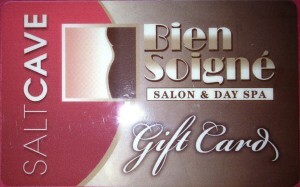 Gift cards are available for a single service, package, or series. Gift cards also cover sessions in our new Himalayan Salt Cave! You may order on-line or stop in during our normal business hours. Gift Cards are non-refundable. We will also be happy to create a personalized gift bag with our Murad skincare or hair and makeup products. You can also customize your gift with ear rings, necklaces, scarves, and bracelets. You can now take home a piece of our Salt Cave to share the benefits. Stop by our Salon and Spa to check out our Himalayan Salt Lamps, cooking products, and body products. Check out our beautiful selection of custom jewelry, scarves, and handbags available for purchase in our salon.